The average sale price of townhomes at the Spruce Pond Village condominiums in Franklin, MA jumped 11.4% in 2017 to $338,300. That’s the highest the annual average sale price has been at Spruce Pond since 2006. 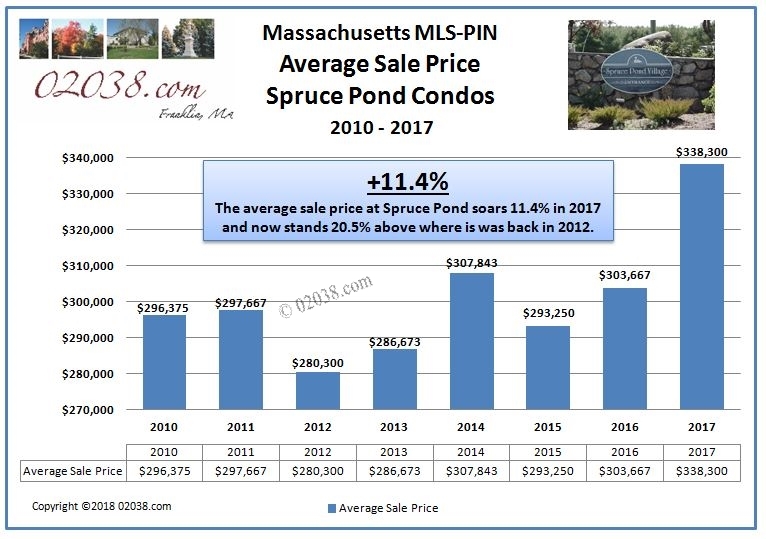 The Spruce Pond average price now stands 20.5% higher than it did at its Great Recession low of $280,300 set back in 2012. The number of units sold at Spruce Pond Village fell markedly in 2017. Only three units sold, compared to the six units that changed hands the previous year. 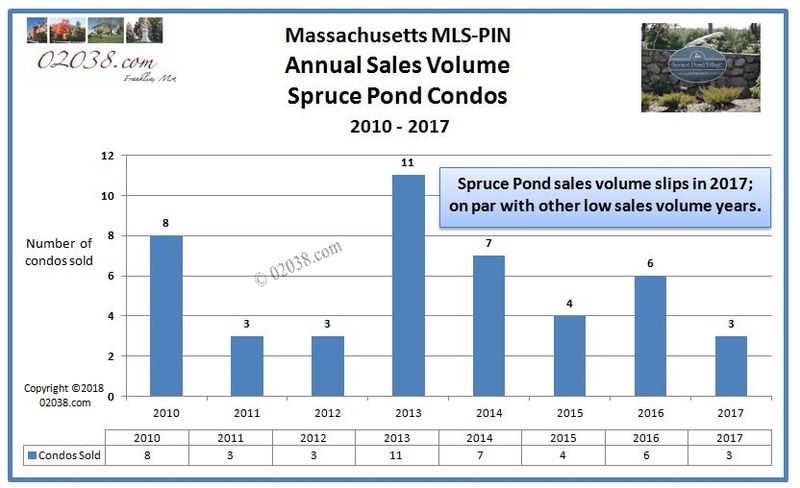 2017’s sales volume at Spruce Pond matches the low annual sales totals seen in 2011 and 2012. 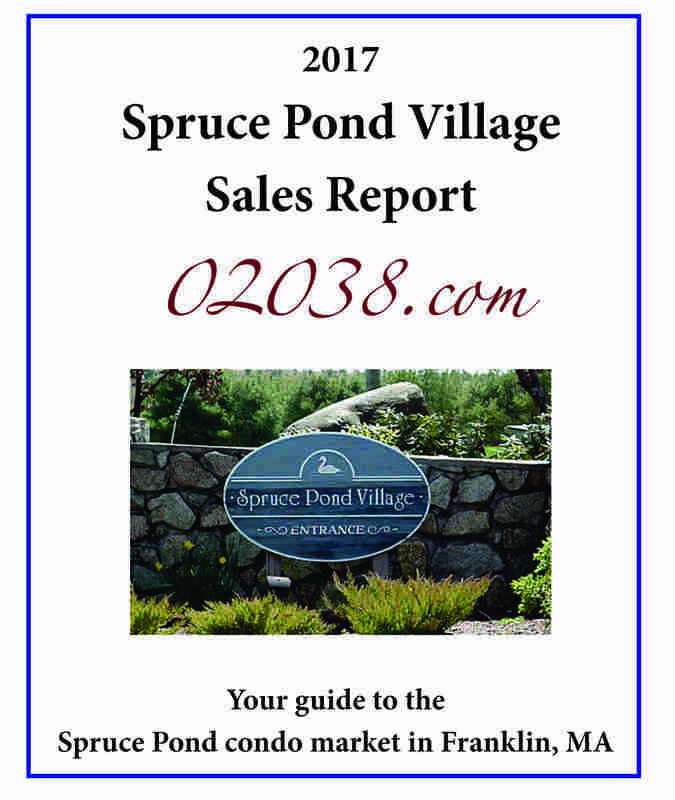 You can access facts and photos of 2017’s sales at the Spruce Pond Village condominiums in Franklin, Massachusetts by following the hotlink at left or in the image below. As you’ll find with most homes in Massachusetts, buyers pay a premium for interior updates. The lowest sale for the year at Spruce Pond was the $305,000 paid for an 1,823 unit with a one car attached garage and an unfinished basement. That unit’s kitchen was the original one installed when the unit was built and needed updating. The top sale in 2017 at Spruce Pond was a 1,943 sq ft end unit with a 2 car attached garage that had a beautiful new kitchen. That unit sold for $364,900. 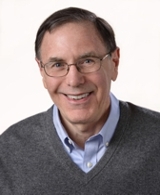 Follow the hotlink at right to learn more about the Spruce Pond Village condominiums in Franklin, MA.